For this comparison, I'll be reviewing 32" television sizes. This makes it easier for those of you who are comparison shopping by price, and let's us focus on features rather than screen size. Every item reviewed is available in a larger size. At 32", you also don't notice a difference between 720p and 1080p, so it's a great size for most homes. If you are looking for a larger screen, check out our Comparison of 1080p TVs. If you've never used a Roku box, stick, or TV yet, you are missing out. I've personally been a long-time Roku 3 user, so when a television came along with Roku built-in, I had to try it out. I chose to mount mine to the wall, but it also looks great on a TV stand, dresser, floating shelf, etc. 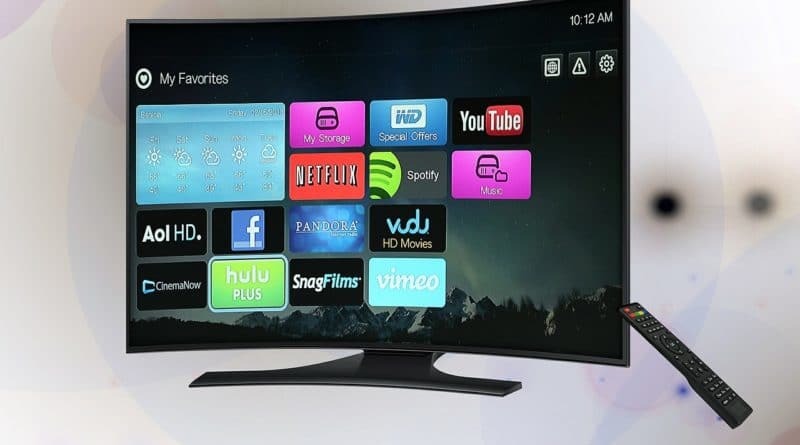 Just like the Roku streaming box or stick, the TV has a very similar interface. There are 3,000+ streaming channels to choose from which mean you have your pick of 200,000+ episodes, clips, and movies. When turning the TV on, you are greeted with a personalized home screen, and the TV updates its software and channels automatically, or on-demand. An integrated search means that you can find movies and episodes across supported channels, so you'll always be able to find something to watch. Personally, I think the picture quality is great and other users have reported the same. The remote control is super simple to use ( like really easy ) and you can also cast your smartphone / tablet screen to the TV. The casting feature works great for apps that are not available on Roku, but are available on an app / play store and are running on your mobile device. 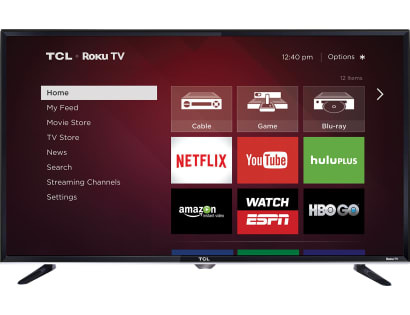 The TCL Roku Smart TV is highly rated on Amazon. It received the Editor's Choice award from PCMag and is recommended by Netflix for HD streaming. LG has a winner with it's Triple XD Engine. While it might seem like a marketing tactic, viewing the display in person really does look more crisp compared to LG's earlier televisions. With a slim profile, this television fits in with almost any decor, whether sitting on a TV stand or mounted to the wall. 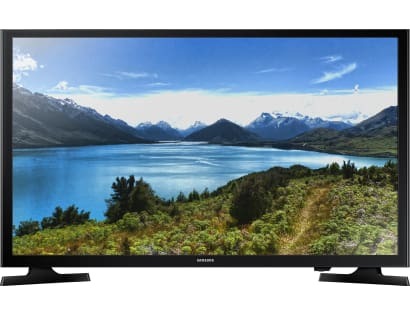 While this model, the LH500B (32" and 43") does not have Smart TV apps (Netflix, YouTube, Hulu Plus, etc) , their other models do. 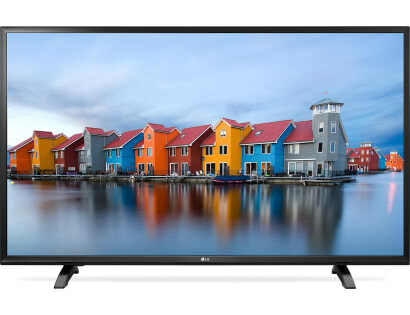 If you are interested in Smart TV apps, be sure to check out the LG LH550B (32" and 43"), LG LH5700 (32", 43", 49"), or LG LH5750 (55") models. Samsung has a few nifty features of their own. They tout Wide Color Enhancer which can help bring new life to both HD and non-HD content. This television also has a USB port for playing music, videos, and viewing photos from an external hard drive, usb stick, and more. Sound on this model is good, supporting DTS content. If you really want to step it up a notch, it's available for sale on Amazon with a Soundbar bundle. Apart from a great price, the viewing angle is great with a clear picture at even extreme angles. Colors are rich and accurate, possible the best of any 32" TV. By itself, this model does not offer Smart TV apps, but Amazon sells it with a Fire TV stick bundle which immediately enables 4,000+ apps, including Netflix, Hulu, Sling, Amazon Video, and more. Of course, you could always get the Fire TV Stick or higher-powered Fire TV Box separately. * The owner of this website, bompus.com, is a participant in the Amazon Services LLC Associates Program, an affiliate advertising program designed to provide a means for sites to earn advertising fees by advertising and linking to amazon.com. Amazon, the Amazon logo, AmazonSupply, and the AmazonSupply logo are trademarks of Amazon.com, Inc. or its affiliates.